Earl Clements has been making and painting didgeridoos for over 15 years. 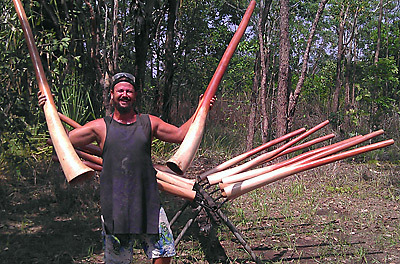 Originally from New South Wales, he has spent the last 20 years in the Northern Territory (near Darwin) where he has been focusing on his artwork and crafting didgeridoos. All his instruments are internally sealed with some serious chisel work and rasping of the flared and bell ends. Buy a Termite Hollowed Eucalytpus Earl Clements didgeridoo online today!